Our new range of baked beans are ready to go! 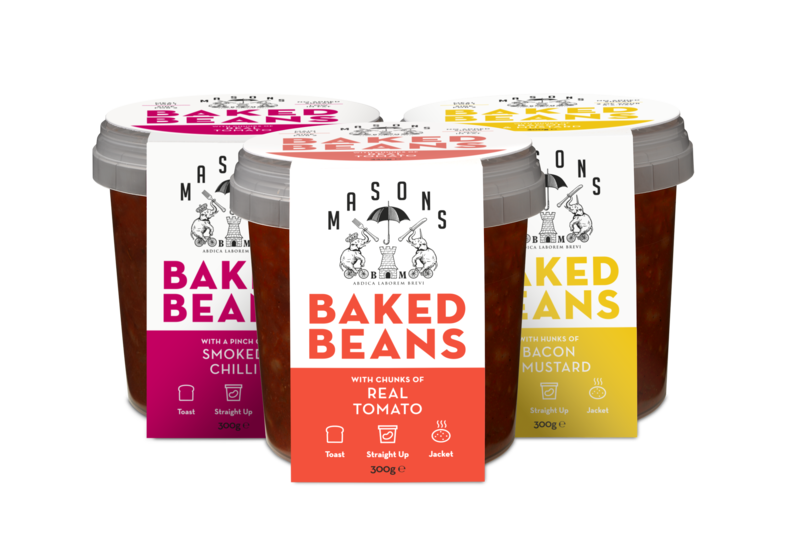 Masons Beans are found fresh in the chiller and come in three delicious flavours and retail from only £2.20. Real Tomato – Our take on tinned beans but much improved with fresh, chunky tomatoes instead of powdered tomato; fresh herbs; and absolutely no sugar at all. Smoked Chilli – Haricot beans, chunky tomatoes and a pinch of smoked chilli for a little kick. Again, no sugar, no powdered tomato. Bacon & Mustard – Chunky tomatoes and bacon mixed with aromatic herbs and a dollop of English mustard. No sugar, no powdered tomato. The recipes owe much to the traditional soaking and cooking of dried beans seen in other parts of the world and bear little resemblance to the canned beans Britons still rely on today. Rather than cooking from dried inside a can, the beans are soaked overnight and simmered gently. Rather than using powdered tomato for the sauce, we use plum tomatoes, which are cooked down with herbs, spices or bacon, creating a hearty, healthy meal in a pot. And, most importantly, we use absolutely no sugar at all, in stark contrast to the tinned variety. Sign up to our mailing list to get the latest news about Masons Beans. Error! Please check the fields.